Assorted boxes of chocolate are my kind of Russian Roulette. It’s fun inspecting the various chocolates, and narrowing the options down to your select few. The nerd in me especially loves when they’ve included a printout with pictures and descriptions to help you decide. Okay fine, I’m realizing this barely qualifies as Russian Roulette...given the worst thing that could happen is you accidentally bite into a booze-filled chocolate. But you get my point. The praline-filled chocolates are always my favorite of the bunch. The creaminess of the nut filling and the firm chocolate coating are a match made in heaven. And while I’m not here to convince you that hazelnuts and chocolate are a good idea (because you should already know that); I am here to tell you that these could be one of the best desserts to come out of our kitchen. In fact, I’m so obsessed with these bars that I’ve been “recipe testing” them for weeks longer than I’ve needed to. And as I write this, it’s pretty hard not to get up and make another batch. Because they’re SO good. 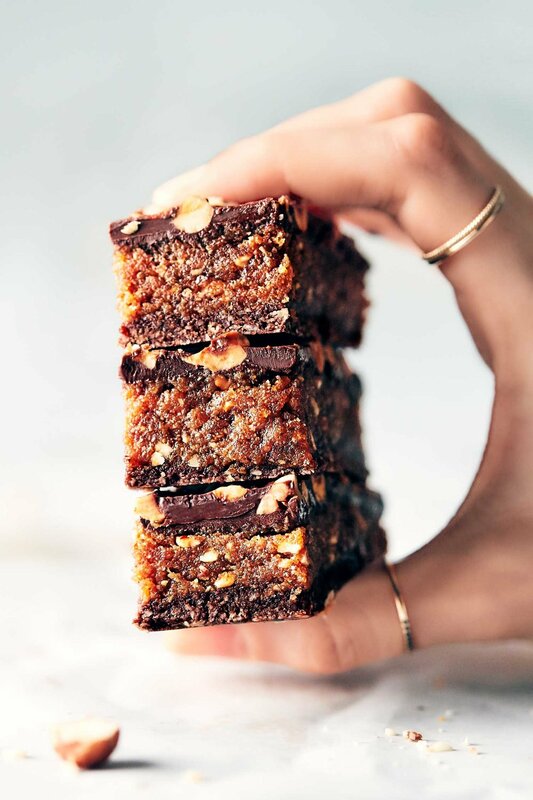 Not only are these bars freaking delicious, but they also come together with only 8 ingredients. They’re vegan and gluten free; and you won’t need to pull out the sugar bag for this one, because these babies are sweetened entirely with dates. In fact, you could even go so far as to say these bars sit squarely on the right side of the healthy(ish) line...and best of all, you’d never know it! Pretty magical stuff, right?? 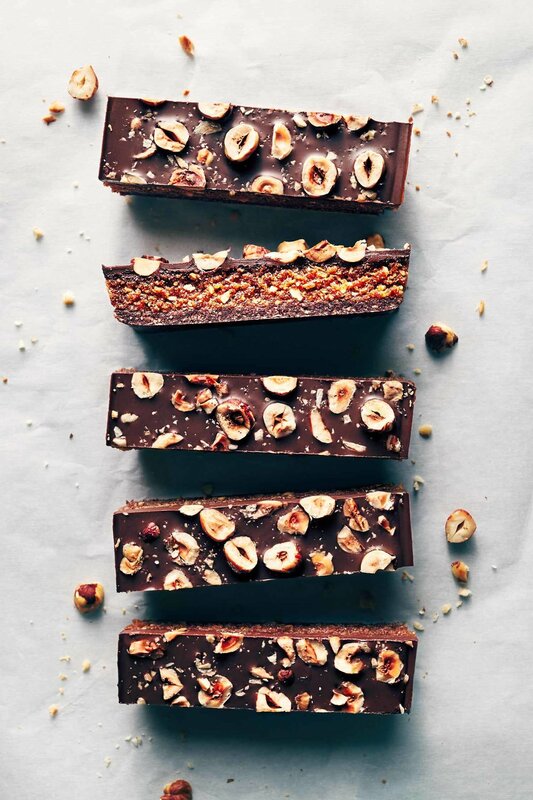 There are three layers of deliciousness in these Chocolate Hazelnut Praline bars. The first is a chocolate oat base. Since the bars themselves aren't baked, I like to use quick oats, because they easily grind down into a fine powder and have already been pre-cooked. You could use regular rolled oats if you prefer. For tidy bars, do take the time to press the base down into a loaf pan until smooth and well packed. Then it’s time for the star of the show: the hazelnut praline filling. The filling starts with toasting hazelnuts then blending it into a smooth hazelnut butter, which then gets mixed with soft dates. It’s essentially a better-for-you version of hazelnut caramel (YUM). Chopped hazelnuts provide a bit of texture in the praline filling. The final layer is a simple melted chocolate, which seals the deal and holds onto a sprinkling of chopped hazelnuts. Definitely opt for a high quality bar of chocolate for melting (as opposed to chocolate chips). The flavor and texture is worth it. Mixing a couple spoonfuls of coconut oil in with the chocolate helps it slice up nicely once chilled. These bars are best stored in the fridge, but can sit out at room temperature for a while before the chocolate softens significantly. Preheat oven to 350°F. Put hazelnuts on a baking tray and roast for 10-12 minutes, until golden brown. Give the pan a good shake half way through. Transfer hazelnuts to a clean dish towel, folding up the sides to wrap and steam the nuts as they cool. Meanwhile, prepare a 9x5” (23x13 cm) loaf pan with parchment paper on all sides. Make the base: Put oats in food processor and process into flour. Add medjool dates and pulse until a coarse meal. Then add coconut oil, cocoa powder and salt. Pulse until well mixed. Empty the mixture into the lined loaf pan, and use your hands to pack mixture down firmly. Use the back of a spoon to smooth out the mixture (if desired). Transfer to freezer while you prepare remaining layers. Next, use the dish towel to rub the hazelnuts together to remove their skins. You can also use both hands to vigorously rub a palmful of hazelnuts together. When most of the skins are removed, transfer 1/4 cup to cleaned food processor. Pulse until roughly chopped, then set aside. Remove an additional 1/4 cup of whole hazelnuts and set aside. Prepare the hazelnut praline filling: Add the remaining 1 1/4 cup roasted hazelnuts to a food processor, alongside coconut oil. Process until it forms a smooth nut butter, giving your food processor breaks and scraping down the sides as required. Add dates, vanilla extract and salt. Process until the mixture is blended into a paste. Transfer filling to a bowl, then fold in the 1/4 cup chopped nuts. Remove loaf pan from freezer, and smooth filling over the base. Use the back of a spoon or spatula to press the filling down firmly. Transfer to fridge. Melt the chocolate topping: In a double boiler (or heat-proof bowl set over a saucepan), melt chopped chocolate and coconut oil. Whisk together until smooth. Pour on top of the hazelnut praline filling. Give the remaining 1/4 cup whole hazelnuts a rough chop, then sprinkle on top of the melted chocolate. Refrigerate loaf pan until chocolate layer has set (approximately 2-3 hours). Remove and slice into 7 large bars, or 14 smaller bars. -*Make sure dates are fresh and moist/gooey. Otherwise, to rehydrate dates, submerge them in a bowl of hot water for 10-15 minutes until soft, then strain and pat dry. When measuring dates for this recipe, make sure you pack the measuring cup as tight as possible. -**You’ll roast all 1 3/4 cups of hazelnuts in the oven. 1 1/4 will be used to make the smooth part of the praline filing, with an additional 1/4 chopped nuts folded in for texture. The remaining 1/4 hazelnuts will be used to sprinkle on top of the melted chocolate. -***Semi-sweet (50-65%) chocolate recommended. Ensure chocolate is dairy-free, if desired.